In 1969, BBC personality John Peel jumped from behind the airwaves and into the industry when he launched his record label, Dandelion. His mission for the label was the same as his radio work: to introduce bands and artist of distinction and quality. 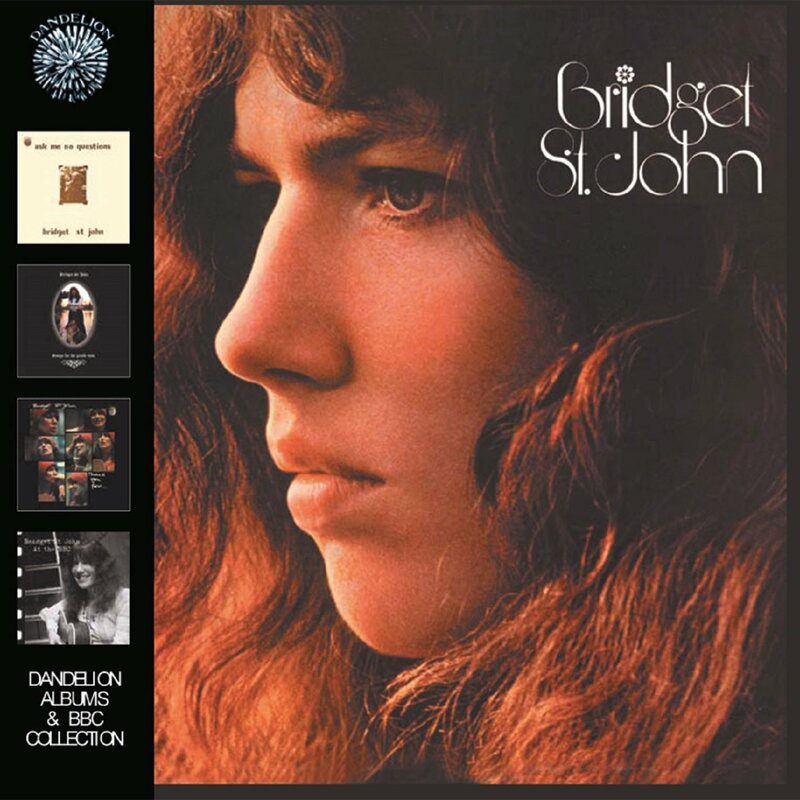 One of the label’s signature artists was a young woman named Bridget St. John, who released three albums and a handful of singles before the label folded in the mid 1970s. St, John’s voice was quite distinctive, and though her music is superficially labeled as folk, it was something much more special. Debut album Ask Me No Questions appeared in 1969 and was a stark affair. Often just her and her guitar, St. John showed her skill as a guitar picker on “Curl Your Toes” and “Lizard-Long-Tongue Boy,” and combined with the stark arrangements, her voice—which has an otherworldly vibe that recalls Nico—creates something dark and foreboding yet oddly warm and compelling. Unfortunately, the lack of sonic variety quickly become monotonous, and the album, while lovely, becomes heavy and tedious. It’s an album of promise, but at forty minutes, it’s just a bit too long, and it feels like something is missing. The fourth disc of this set, of contemporary BBC live performances and Peel Sessions, flesh out the peculiar flatness of the album’s production, as even on the songs that are poorly recorded (rarity triumphing sonic fidelity here), her voice has a magical quality that draws the listener in. She got better, though. Album number two, Songs For The Gentle Man, appeared in 1971, this time produced by Ron Geesin, an arranger who understood the beauty of her voice, and, more importantly, the kind of flourishes and sonic coloring required to make it blossom. The string section of “Seagull-Sunday” propels the song into an otherworldly place, a garden of sonic delight; the horn section of “The Lady And The Gentle Man” adds a fleeting touch of humanity to the melancholy lyrics; the tasteful strings on “City-Crazy” make an already pretty song even prettier. The highlight has to be “The Pebble And The Man,” a Donovan cover that engages and traps the listener in its catchy, bouncy melody—much to their delight. Unlike the odd heaviness of her debut, these twelve songs pass quickly, a tight collection of a dozen songs that compel the listener to hit repeat. Her third album for the label, Thank You For…, appeared a year later; produced by Jerry Boys, it was an amazing leap forward. From the opening “Nice,” one hears a Bridget St. John that’s become refined. Gone are the Nico-isms in her voice, instead opting for a straight up country-rock/folk flavor that’s really appealing. The arrangements are lush and fleshed out, but not in as fantastical a way as its predecessor. One might say that she’s going for a more commercial sound, a more straight up and accessible record. It’s certainly true; her takes on Buddy Holly’s “Every Day” and Bob Dylan’s “Love Minus Zero/No Limit” are clean, polished numbers that would have sounded great on a 45, and the bluesy “Fly High” (which features guitarist John Martyn) breaks from the folk realm and is a dark, moody rock number. For this reissue, two fine b-sides are included, as is a live performance that finds her in fine voice. While Thank You For… was a commercial leap forward…it didn’t happen. Dandelion folded shortly after the album was released, and she moved on to Chrysalis, where she released Jumblequeen in 1974…and that was it for her recording career. That doesn’t mean she was finished; in fact, she has kept busy over the last forty years, working with others and occasionally touring. This collection of the bulk of her recorded output shows that while the success she might have sought never quite came her way, it wasn’t for the wont of quality material, and this box set shows that these jewels still shine brightly four decades on.